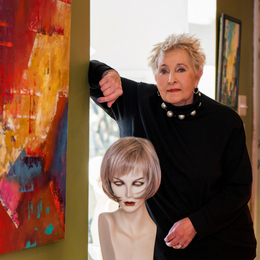 In her work as the owner of Images Hair Replacement Studio, as well as in her career as a renowned contemporary artist, Gloria Harrelson has found her bliss. Everyone is an artist these days, with restaurateurs, home remodelers, and even business owners having ascribed the term to their respective lines of work. Gloria Harrelson, owner of Images Hair Replacement Studio in Jenkintown, refers to herself as an artist, too, but when she does so, she uses the term in a purely literal sense—meaning someone blessed with the talent to turn a blank canvas into a masterwork that draws the eye. Harrelson works in both abstract art and realism. Likewise, she paints in both oil and acrylic—“mostly acrylic, because I’m impatient,” she says—and she also uses wood and metal to create three-dimensional contemporary works of art. Her work has graced the walls of galleries throughout Pennsylvania and New Jersey, including the Cellini Studios and Gallery in Ambler, the Cathy Begg Gallery in New Hope, and the Main Avenue Galleria in Ocean Grove. She also sells her art through her website, GloriaHarrelson.com. Harrelson’s salon clients appreciate the fact that she has such a strong artistic bent. Far from a typical hair salon, Images Hair Replacement Studio offers a range of customized restoration services devoted to treating hair loss for men and women, including laser hair restoration, bonded hair systems, and microlink extensions. The salon has twice won Philadelphia magazine’s “Best of Philly” honors in the category of hair loss solutions. “This work has been wonderfully gratifying,” Harrelson says. “It started years ago with a wig business, helping people get through chemotherapy, and that’s still a portion of my business. When someone comes in for a free consultation, I learn about their lifestyle and what they want to gain, and then we come up with the best solution for them based on their needs. People don’t want to lose their hair; it changes their life when they do. Once we start applying hair, you can see the confidence it gives them. Balancing two careers has not always been easy for Harrelson, but she wouldn’t change anything. Her two passions are interconnected, with one feeding the other. In fact, her salon serves as a gallery of sorts, with many of her paintings adorning the walls.